There is no other app that shows sailors the optimal tacking routes, or that accounts for the fact that sailboats zig-zag (tack), when calculating your Estimated Time of Arrival (ETA). Just enter the angles of the wind and your destination, and presto: you get the optimal tacking angles. 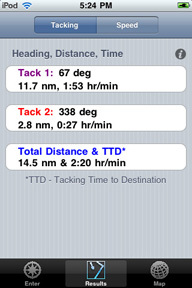 Add the distance to the destination and you can tell your overall tacking distance. And if you add your boat length, you can even tell how long it is going to take to get there. Even on an iPod, with no GPS. Note: The next version of the SailTimer app will also include the ability to receive real-time wind speed and wind direction. It can continuously update the optimal tacks and TTD (tm) with wind data coming magically through the air from the solar-powered, wireless SailTimer Wind Vane. As you can see from the screenshots above, you get navigation capabilities designed especially for sailors. Standard GPS chartplotters do not account for the obvious fact that sailboats zig-zag across the wind. How can they calculate your correct ETA if they don't know how far you are tacking? Unlike the cost of GPS chartplotters, this is an inexpensive download for a device that you can carry around in your pocket. It is pretty amazing that in all of the centuries of seafaring traditions, there has been no easy way for sailors to get the optimal tacking angles and to know the Tacking Time to Destination (TTD) -- until now. 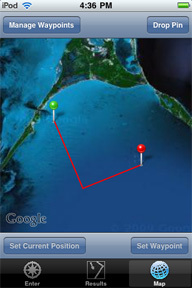 The iPhone and iPad 3G have a GPS receiver. But even when there is no GPS (on an iPod or certain iPads) or no internet connection (for Google Maps), you can get some very helpful tacking information. With the SailTimer app, you get a large speed display, the ability to Go To waypoints, the ability to see the lat/long position of your tacking mark, and bright red lines overlaid on the maps to show each tacking leg. It also has a range of additional capabilities, such as showing you how far it is to a waypoint from your current position, and whether you will be able to sail there in time for dinner. At only $13.99 it is probably the smallest investment in marine navigation equipment that you have ever made. Problems seeing your iPad, iPhone or iPod Touch outside? Some people have had good results using an anti-glare film, like these ones from 3M and Speck. Your local big-box computer store may have others too, like this one from Zagg and this one from Belkin. 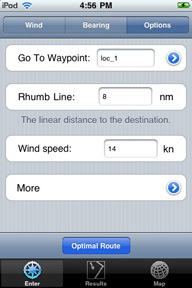 There are also GPS attachments for iPad and iPod Touch (no internet connection required). Copyright 2005-2011 (c) SailTimer Inc.